Frozen puff pastry makes this chic dessert extra easy. 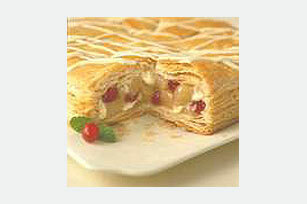 White chocolate chunks, canned pears and dried cranberries are baked inside two flaky sheets. Preheat oven to 375°F. Beat egg and water in small bowl; set side. Unfold pastry sheets on lightly floured surface. Trim about 1 inch off each corner of each pastry sheet. Reserve trimmings to use as decorations. Place 1 pastry sheet on ungreased baking sheet. Chop 4 oz. chocolate. Mix chopped chocolate, pears and cranberries. Spread down center of prepared pastry sheet to within 1 inch of edges. Brush edges with water. Top with remaining pastry sheet. Press edges together with fork to seal. Decorate with reserved pastry trimmings. Brush with egg mixture. Cut several 2-inch slits, 2 inches apart, in top of pastry. Bake 35 min. or until pastry is golden. Cool 30 min. on baking sheet. Melt remaining 2 oz. chocolate as directed on package. Drizzle over pastry. Let stand until chocolate is firm. Balance your food choices throughout the day so you can enjoy a serving of this rich-and-indulgent pastry with your loved ones. Cut reserved pastry trimmings into decorative shapes using cookie cutters or small knife before using to decorate top of dessert as directed. Microwave 2 oz. of BAKER'S Premium White Baking Chocolate in microwaveable bowl on HIGH 1-1/4 min., stirring every 30 sec. (The squares will retain their shape.) Stir until chocolate is completely melted. Use a teaspoon to drizzle chocolate back and forth over dessert in desired design.